Save 10% on your first purchase! Use the code "WELCOME". *Not valid on Clearance. 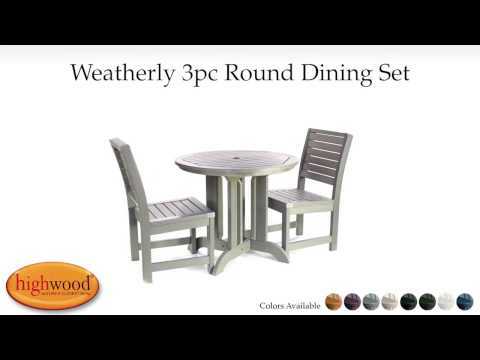 This Weatherly Dining Set features our classic 36” round dining table (including umbrella hole) with 4 armchairs for a sleek seating and dining area. The Weatherly Collection’s modern, clean lines provide a beautiful look to the chairs that surround our sturdy and well-built table. This Dining Set will be the envy of your friends and neighbors. Best of all, our material doesn’t absorb moisture and repels dirt and grime, making clean-up a breeze. Dining separates can also be purchased to expand your set further. Explore the entire highwood® product line to coordinate other beautiful and durable products to enhance your outdoor living space. The chairs have been load-tested, per ASTM 1561-03 (2008) standard for Outdoor plastic furniture and have a 500-pound weight capacity. Some assembly is required (see assembly guide). Please note, this is a larger item that ships LTL and the boxed components are delivered on a pallet. So kick off your shoes and let the stress of your day melt away. *Orders over $49 (net order value) ship free via domestic ground carrier to customers residing within the 48 contiguous United States. Orders less than $49 will incur a $9.99 shipping fee to these states. For deliveries outside of the contiguous United States (and international orders) additional shipping charges will apply. Please contact us for a quote. When you choose highwood® products, you are buying from a company that is committed to excellence and cares deeply about your complete satisfaction. We take great pride in being “Made in the USA” and in crafting beautiful, durable wood-alternative products that will enhance your outdoor-living space. If your purchase is in any way not living up to your expectations, we want to know about it. Our dedicated Customer Care team is here to help you Monday through Friday (8am-5pm EST). We aim to handle all inquiries within 24 hours. Please contact us via phone or email. Highwood products are designed to provide years of comfort with very little maintenance. That’s the beauty of Highwood after all — the look of natural wood without the headache of annual painting or staining. Our unique synthetic material, combined with 304 grade stainless hardware, means that you can leave our products outside year round, whatever the climate. For detailed information on how to clean or repair minor dings on our products, please take a look at our “Care & Maintenance” section. At the start of each season, (or as needed) use hot soapy water and a brush to clean the surface from dirt & grime that build up on your products. Give an extra scrub on edges of the product that have been machined/cut (front edges of arms on chairs). For stubborn stains you can carefully use a power washer to remove grime, but be sure to use a medium/wide nozzle (fine/narrow nozzles can damage the product). In day-to-day use wipe up any stains or spills on your Highwood products as it happens with a damp cloth. Should you have additional questions about care & maintenance, you can reach us by email or telephone. Our Customer Care team is ready to help you. Your Complete Satisfaction is our Goal. Important note: The information below relates to purchases that you make directly from the Highwood USA eStore. Should you purchase a Highwood product from one of our authorized retailers, please contact their customer care team and they will handle your repair / return. When we receive your product it will be inspected and the refund will be issued once we confirm that the item meets the above requirements. Highwood USA is not responsible for the cost of returning the product when the return is “Buyer’s remorse”. You can either make your own arrangements for the return of the package or Highwood can make arrangements for you and deduct that cost from the refund value. If we need you to send the whole product back to us, we will (a) provide you with a Return Authorization # (this RA# should then be written clearly on the outside of the box) and (b) make arrangements for return shipping at your convenience (which we will pay for). If we decide to remedy the problem by sending replacement parts, we will ship those directly to you to fix the issue. Subscribe to the Highwood USA mailing list to learn about new product releases, exclusive offers and tips. Get EXCLUSIVE offers, discounts & product updates by signing up for our newsletter. © Highwood. All Rights Reserved.